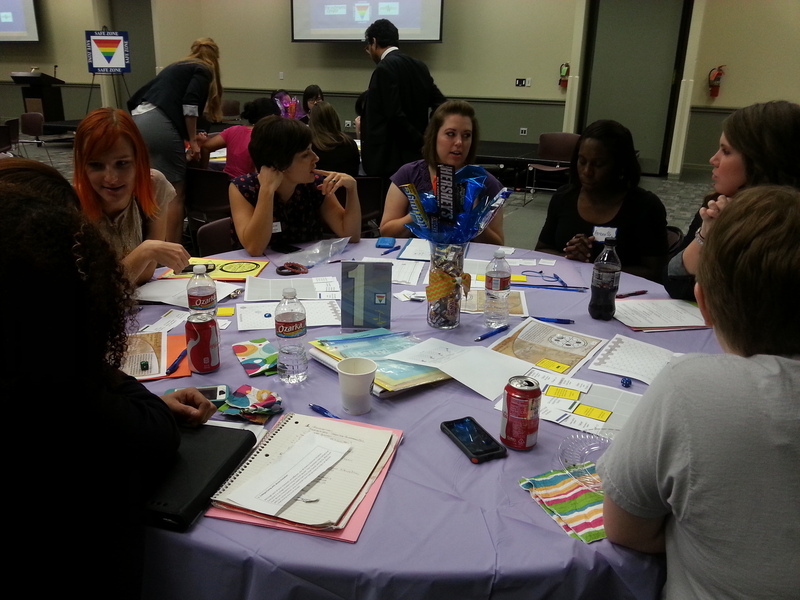 Putting the Pieces Together is a unique educational workshop that uses the medium of board games to teach people about the unique challenges queer women experience in leaving abusive relationships. Commissioned by the Women’s Center of University of Texas at Dallas and tested frequently by the local community, the game provides people with not only a greater knowledge about this complex system, but a way of starting critical conversations and building empathy. Presented to over 50 people at a recent workshop, the event had people leaving with emotionally powerful experiences, as well as unique conversation and dialogue about this very serious issue. 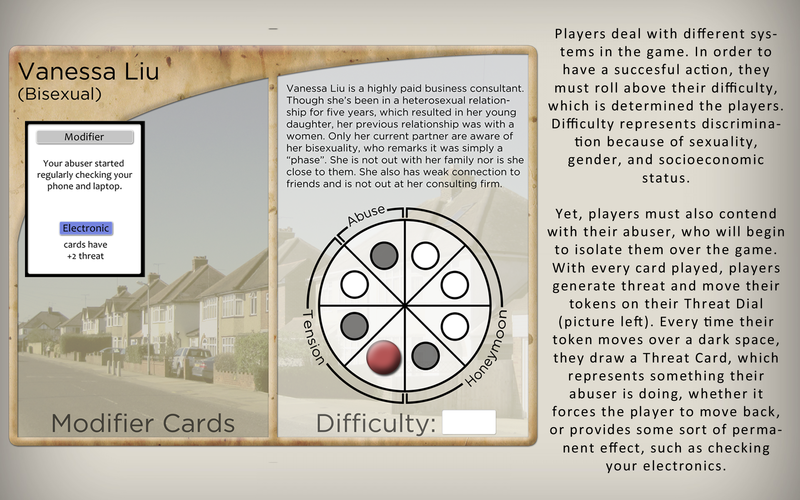 The project eventually developed into a commercially available game called Ending the Cycle. 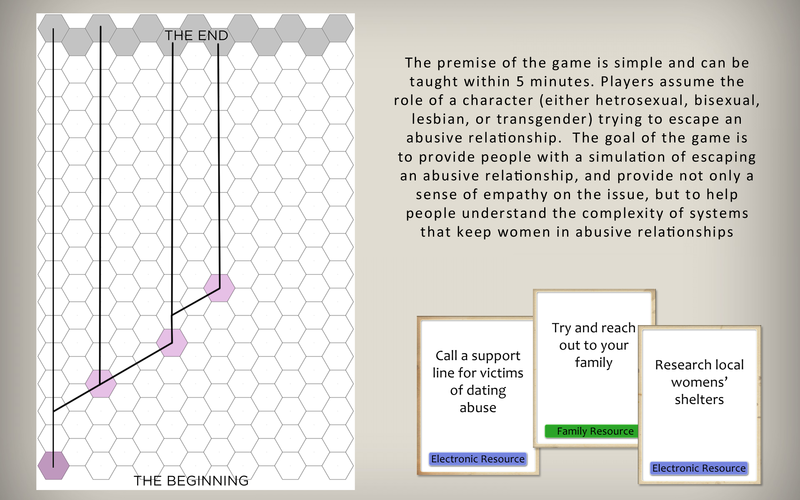 Developed specifically for workshop environments, facilitators lead a group of people in games where they assume the role of a woman attempting to leave an abusive relationship. Groups of people play a character together, working together to decide what decisions are most advantageous for their character’s unique background and situation. Each facilitator leads three of these groups, where one can be a heterosexual woman, a bisexual (or lesbian) woman, and a transgender woman. First working together in their small groups, people are able to gain experience and knowledge about the system to help bring them into a greater conversation with all groups about what they learned. While a major point is to communicate these experiences, the main purpose of the workshop is to ensure people critically observe these systems and build conversation about how we can not only change the rules of the game to make it more fair, but to change the rules of real life as well. The game has been presented in a large setting to a very positive response. Currently, the game is still revision in order to provide a better user experience and provide a much more accessible facilitator guide. The final release will be in January 2014, at which I hope to bring this workshop to different universities. You can learn more about the game mechanics in the pictures below. If you have any questions on specifics or the workshop, feel free to send me a message (peterwonica@gmail.com).